Sign up to receive news, updates and a beautiful photo for download as a screensaver or print to frame. Thank you! In a few moments, check your email to receive your gift. Stay tuned for demonstrations coming up at the end of August. Dates and Times will be announced soon! Are you a military spouse or caregiver who wants greater peace in your family relationships? Are you caring for someone dear who suffers from PTS or a TBI? Would you like a break? 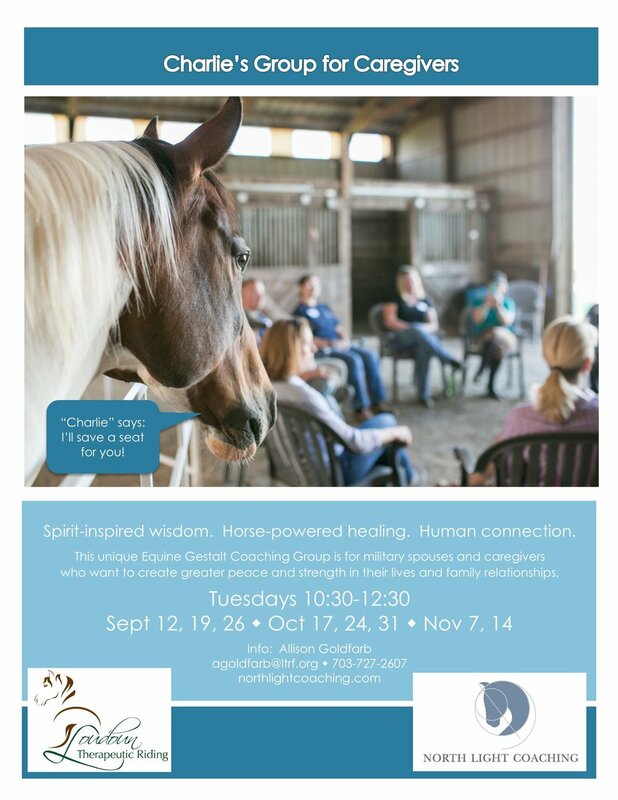 Allison and "Charlie" have a seat for you in caregivers support group this fall where you'll be offered two hours each Tuesday morning for you - to rest, heal, listen and be heard. You may drop in to this group - no pre-registration required. There is no charge for this event! RSVP is appreciated to allison@northlightcoaching.com or 703-727-2607. Questions? Please feel free to call or write.